Indonesia’s military has signed a $1.1 billion contract for three submarines. What does that mean for the region? For more than three decades, TNI-AL operated two German-built Type-209 submarines. However, many deem them insufficient for Indonesia’s wide array of maritime security needs given its vast archipelagic expanse. As far as the TNI-AL is concerned, the minimum required capabilities are circumscribed by the Defense Strategic Plan 2024, which called for at least 10 submarines. Even back during the early Cold War years, the TNI-AL’s fleet of Soviet-supplied Whiskey-class submarines were barely sufficient. Assuming mandated needs for routine maintenance and training cycles, only one Type-209 boat is available at all times. 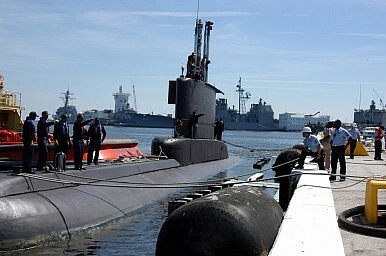 This submarine force will most likely be stretched to its limits in times of crisis. Still, the pair of submarines does offer a modicum of “fleet-in-being” deterrent against potential foes considering decades of experience gleaned by TNI-AL’s submarine crews and their familiarity with the Indonesian archipelagic environment, which will certainly be exploited to maximize the deterrent effects of this tiny force. It isn’t presumptuous to assume that the two Type-209s have already completed a major portion of their useful operational lifespan notwithstanding recent refurbishment. The new submarines may partially replace and eventually substitute the existing pair, thus leaving the TNI-AL with only three operational boats by end of 2025. Such a force is still small and barely sufficient for Indonesia’s needs. In contrast, Vietnam, also with a significant coastal geography, will be able to muster six submarines once its Russian-built Kilo Project-636 boats become operational before 2020. Singapore, with a considerably smaller coast to cover, will probably muster four submarines assuming that the ageing ex-Swedish Sjöormen-class is retired and then supplanted by the newly-inducted Västergotlands. From a technical perspective, the newly-acquired Type-209/1400s were far from what an earlier TNI-AL chief once promised back in 2009, namely to be “more superior” to those possessed by neighboring navies. Even though they sold the Type-209 to Indonesia, the South Koreans no longer rely on this class, which is now gradually being supplanted by the more advanced Sohn Won-Il class (Project KSS-2) which is a modified German Type-214 variant. Therefore, the Type-209/1400 represents little incremental capability over existing Type-209 models. Moreover, the new boats aren’t known to be equipped with “breakthrough” capabilities that may otherwise tip the balance of naval power in Southeast Asia. For instance, there’s no provision known for air-independent propulsion that can prolong endurance underwater as in the case with Singapore’s Västergotlands. Even if TNI-AL’s new boats can utilize submerged-launch anti-ship cruise missiles, this capability is not new, given that Malaysia’s Scorpene-class submarines are already outfitted with the SM-39 Exocet. The Vietnamese Kilos, meanwhile, are reported to be armed with Russian-designed Klub-S missiles. In sum, quantitatively and qualitatively, TNI-AL’s newest submarine purchase may not significantly affect the regional balance of naval power. However, this acquisition reflects an unprecedented expansion of the regional submarine inventory. From a maritime security and safety point of view, this still warrants concern. On the one hand, the confined Southeast Asian maritime geography – characterized by semi- enclosed and narrow water-bodies – makes for excellent submarine operations (though it’s a headache for anti-submarine hunters). On the other hand, this provides an ideal recipe for potential incidents, inadvertent or otherwise. Virtually all submarines operated by regional navies are equipped with signal intelligence capabilities and this amplifies the risk of naval incidents at sea with potential security ramifications. This is especially so given sensitivities over longstanding maritime-related disputes. Moreover, regional submarine rescue capacity is far from adequate considering the numbers of submarines in or about to enter service. To date, only Singapore can muster a full-fledged submarine rescue capability in the form of the Swift Rescue submarine rescue vessel and its DSAR-6 submersible. Currently, the Malaysian and Indonesian navies don’t possess equivalent capabilities and their ongoing modernization programs don’t appear to include the acquisition of such. By comparison, most Northeast Asian submarine operators possess relatively significant submarine emergency response capabilities. Japan, for instance, possesses dedicated, specialized capabilities for complex submarine rescue operations. Even the antiquated North Korean Navy possesses a Kowan-class catamaran-hulled rescue ship equipped with a rudimentary diving bell for its force of over 20 operational combat submarines. Southeast Asian countries can leverage an earlier agreement from late last year to bolster regional naval cooperation by considering collective submarine emergency response capacity-building. Given the operational sensitivities of national submarine activities, confidence-building measures such as zonal restrictions on submarine operations aren’t likely to materialize. However, collaboration in submarine emergency response offers an alternative avenue. In this regard, Singapore can play a leading role in planting the seed for such a capacity in Southeast Asia. One way to do so is to pool submarine emergency response capacity and devise regional protocols to deal with contingencies related to submarine incidents. However, no regional cooperation can wholly substitute capacity-building at the national level. Existing submarine operators and aspirants should ensure that such capacity is prudently developed in parallel with the introduction of submarine capabilities. As it stands, while Southeast Asian navies are busily seeking an underwater combat capability, most if not all of them appear to have neglected this crucial issue. Koh Swee Lean Collin is an associate research fellow in the Institute of Defense and Strategic Studies, a constituent unit of the S. Rajaratnam School of International Studies in Nanyang Technological University, Singapore.